As a wheelchair user, as a result of a spinal injury in childhood, I have continually strived to be as independent as possible. Now as a Director of a 3D Visualisation company serving the Hospitality industry, I truly believe that our products provide real value to guests and hotels alike. Throughout my life independence has been vital for me to overcome my disability and feel equal to my peers. Travel has always been a passion of mine. Travelling with a disability brings its own set of challenges. Accessibility is essential. In my determination to push boundaries in my youth I have found myself in some extreme situations – once through an embarrassing lack of research I found myself in a basket strapped to the back of a sherpa trekking up Mount Everest! This was definitely a step too far and that experience made me much more careful in my pre-travel accessibility research. Even after thorough research I have found myself many times in a situation where a property is not as accessible as it appeared (or claimed to be) on its website. It has been well known that Hotel Photography can be misleading and camera angles can be used to make be a space appear wider than it actually is which can be hugely problematic as a wheelchair user. The fact however that Hotel photography lacks the visual information included within a 3D Floor Plan. The practical ease of using 3D Visuals during the booking process is of particular personal interest to me. Photo-realistic 3D Floor Plans made to scale are so exact that guests who require accessible accommodation can book in confidence knowing that on arrival they will be able to enjoy their stay – whether travelling alone or with family and friends – and with the same level of dignity and independence that everyone else can take for granted. One 3D floor plan provides a wheelchair users more visual information than might be contained in twenty or thirty photographs. 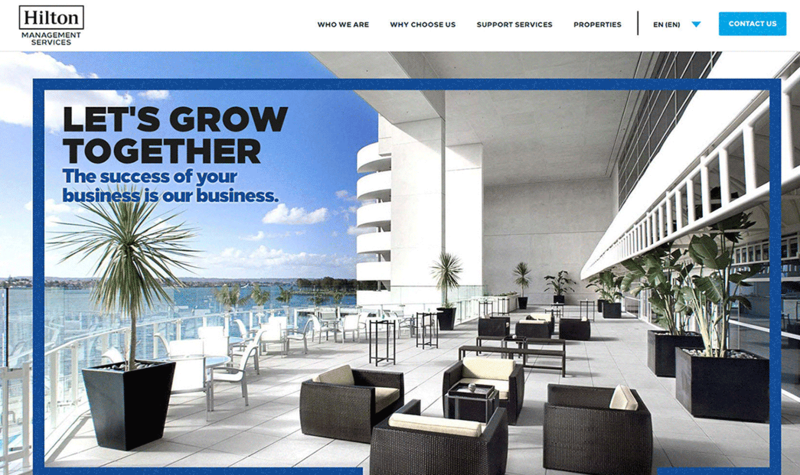 This aids the decision making process when it comes to booking a room or suite. 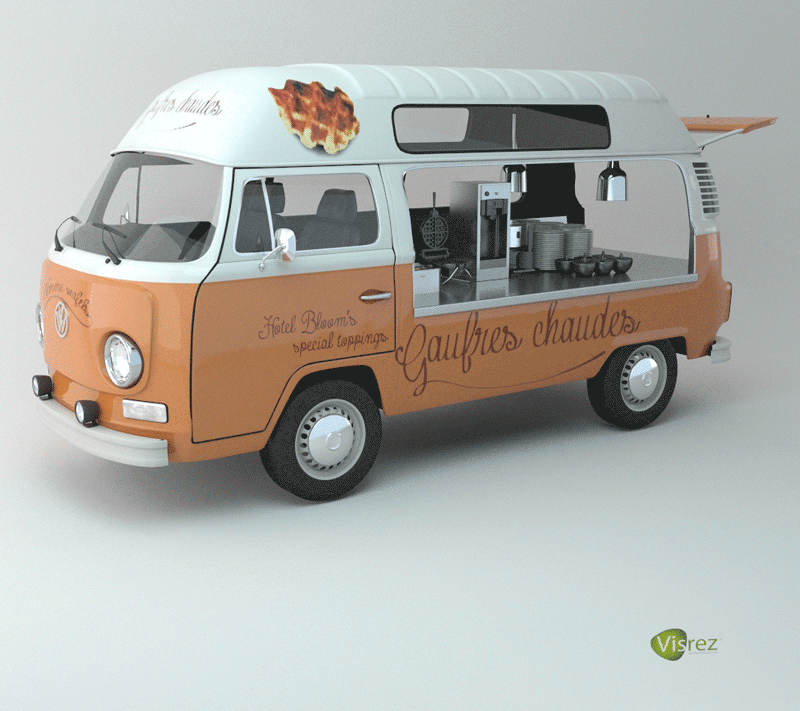 Our goal at Visrez to make the process of generating photo-realistic 3D Visuals as efficient and cost effective as possible for our clients. Since 2014 Visrez has revolutionised the process of creating 3D Floor Plans, Visuals & Virtual Reality and today our products are used by clients worldwide in over eighty countries. Our goal is to build the most advanced 3D Visualisation platform to serve the industry as a powerful resource. Our talented team is continually working on updates to improve the user experience and functionality of the platform. In order to continue improving and developing Visrez it is necessary to make some changes to the way we license our products. As of December 1st 2018, all orders will require a license & support plan to cover any future model updates and provide full access to the platform tools. License & support plans are based on the number of models ordered per property. After December 1st 2018, any order without a license & support plan will have limited access to Visrez following production and will not be eligible for future model updates. Interactive Plans & Virtual Reality Apps are not affected by this update as these products are licensed annually. Our team takes pride in producing the very highest quality 3D Floor plans but a lot depends on how well they are displayed within a client site. Up to now clients generally downloaded the plans from Visrez and added them to their photo galleries and accommodation pages. 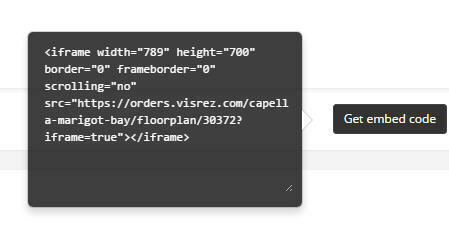 We decided some time ago to improve the embed code function to allow more flexibility when adding plans directly from Visrez. We are excited to release the latest version of our 3D Floor Plan viewer which allows clients to add a responsive 3D Floor Plan viewer to their website using a single line of code. 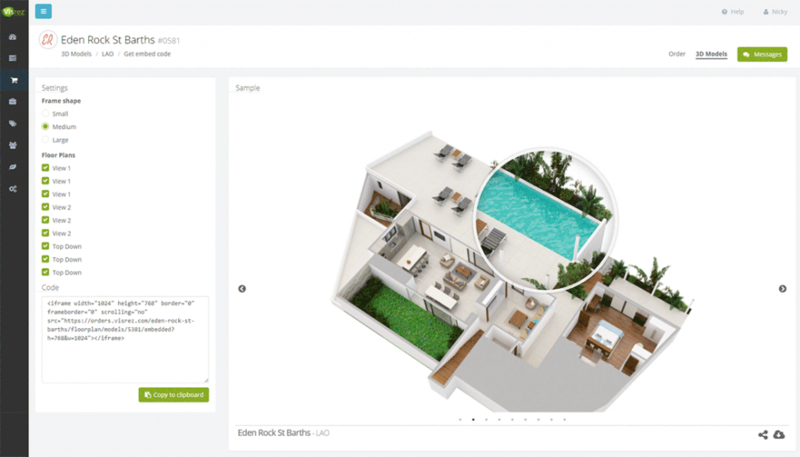 Responsive – 3D Plans will expand to match the available space of the user’s browser window. Full Screen Button – All plans can be opened full screen from within the viewer. New Options Menu – Choose From Small / Medium or Large Size Plans. Display Property Name, Icon and Room Name or change background colour. By using the embed tools in Visrez it also allows us to provide detailed tracking on the usage including session time, countries and referral sources. This information can be accessed at all times in Visrez and in email reports which can be scheduled weekly or monthly. In built reporting tools to help you understand visitor engagement. Tracking and reporting for Interactive Maps & VR were features we had planned to incorporate for a long time and are delighted to announce that as of July 2018 all VR and Interactive Maps have in-built reporting in Visrez. Clients had been telling us how valuable the Interactive Maps and VR Spaces were to their sales teams but one crucial thing was missing, analytics on how customers engaged with these tools. We have built in a Tracking button below each Interactive Map or VR App linking to a reports page with a breakdown of the user sessions, countries, devices and referral sources from the date of launch. Prominent placement of the Interactive Map or VR will generate more sessions so it is important to ensure they are easy to find within your site. There is no point in producing high quality interactive content and not making it easy for potential customers to find in your site. Some client apps enjoy daily sessions of several hundred unique users for the Interactive Maps. Average session time is the best indicator of the value of VR and Interactive maps to our clients. Session times for both VR and Interactive Maps range from two to above ten minutes which are multiple times greater than the average duration of a web-page session. Increased engagement helps the customer’s decision making process when researching an event space or venue. We have added a preferences page to allow clients manage report settings across all VR spaces in their account. 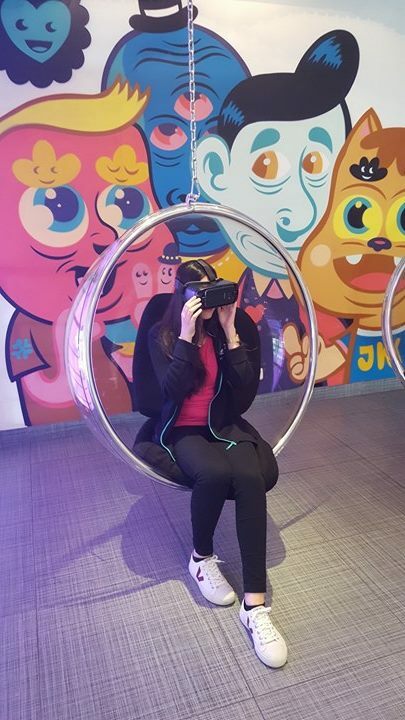 Reports are emailed at the start of each month and clients can update their preferences to receive reports weekly or opt out of receiving email reports for specific VR spaces. So if you just want to generate a report for your ballroom this can be done. 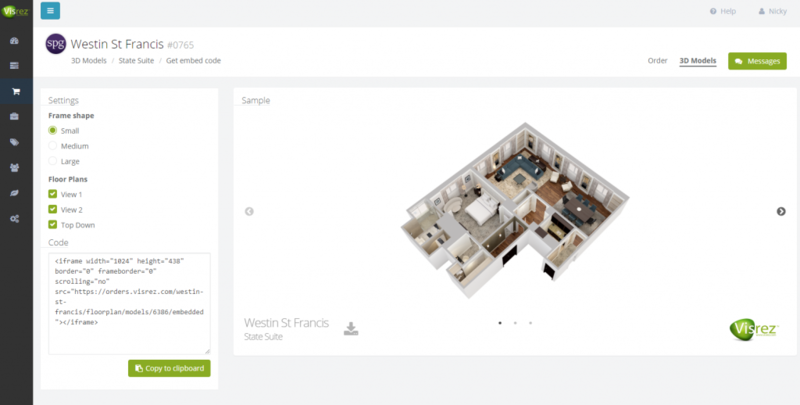 We have released new sharing tools to make it easier to integrate 3D Floor Plans with your website. The new embed tool allow clients to create customised iFrames which can include all views for any model. For Guestrooms & Suites this means you can generate an iframe code with the zoom tool with all three views which can be embedded in your site. For Meeting & Event Spaces you can include Floor Plan Views, Layout Views and Interior Visuals if they have been produced for a model in Visrez. Using the options menu you can choose which views to include in the iframe and the system generates the code immediately. The user can customise the display sizes in the options menu allowing you to choose between Small (1024 x 438) Medium (1024 x 768) or Large (1024 x 1024) Frame sizes depending on the available space in your page. All views load with the Magnifier tool and have buttons to switch between views. Embed iframe contains Share & Download options which make it easier for your team to share a specific view with clients. If a specific style is required for your brand we can create customised iframes. To discuss this option please contact us via the messages in your account. 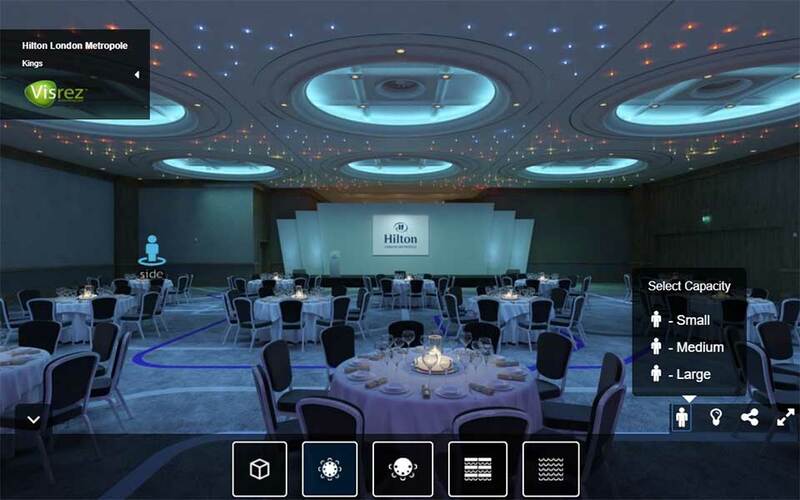 VR is a truly powerful sales platform which will revolutionise how event spaces are presented to customers. The only limitation is that not every consumer owns a VR headset at present. Big news however came recently when Google announced that the latest version of Chrome will support VR on the web, allowing users to enjoy VR content on any device using Chrome. This will make VR accessible to more consumers because it can be experienced in the browser without any installed app which is a huge step forward for growth of consumer VR products. 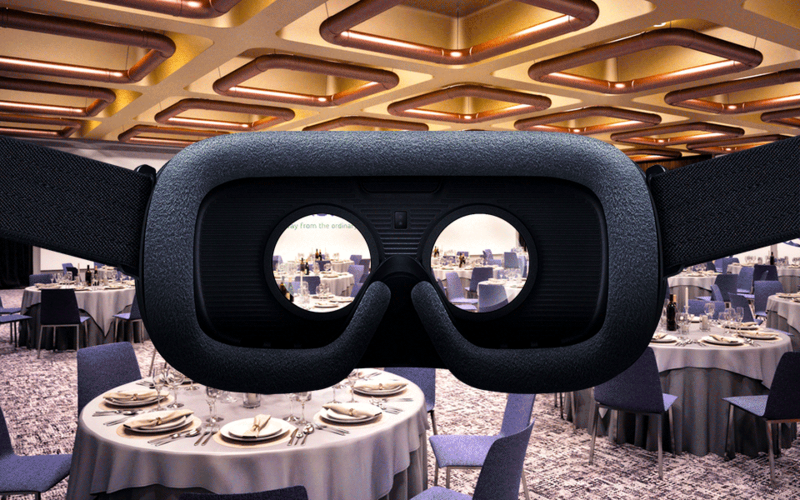 Our team have been working on a WebVR viewer for event spaces for some time because of the huge potential as a sales tool for meeting & event spaces. Imagine being able to present any space in photo-realistic quality VR without needing to arrange a photo-shoot or set-up a room. Everything is created from assets uploaded to Visrez by your team. 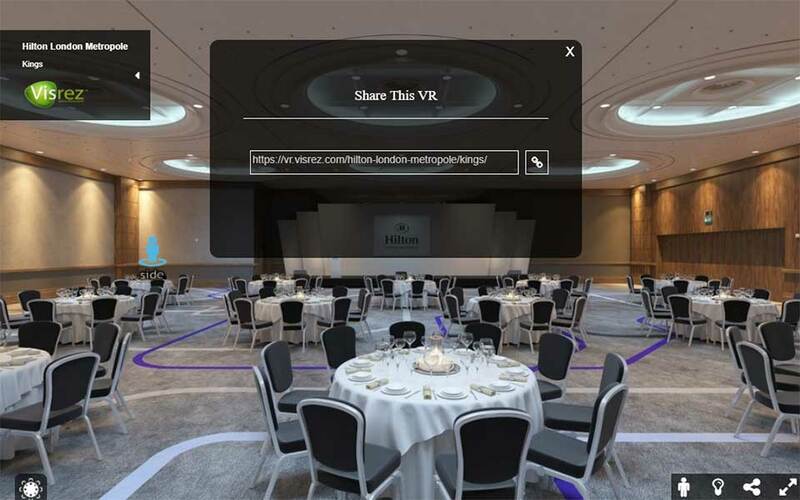 WebVR can be available 24/7 to allow your customers interact with your spaces when selecting a venue. The Visrez VR allows your customers to switch set-up styles, positions and lighting options inside in the space as if they are standing in the room. Now imagine standing in an empty room with a client and being able to demonstrate the same room in any style in photo-realistic VR on your mobile phone. As you rotate the phone it corresponds exactly with the actual space you are in. You can switch set-up styles, change position or even dim the lights on your phone to give an accurate sense of what the room looks like when set-up. In Visrez every space has its own unique URL which allows you to email any room with all the set-up styles and options to your client which they can experience in on their mobile or desktop without the need to install any custom application. To test this on your phone you can use this link. 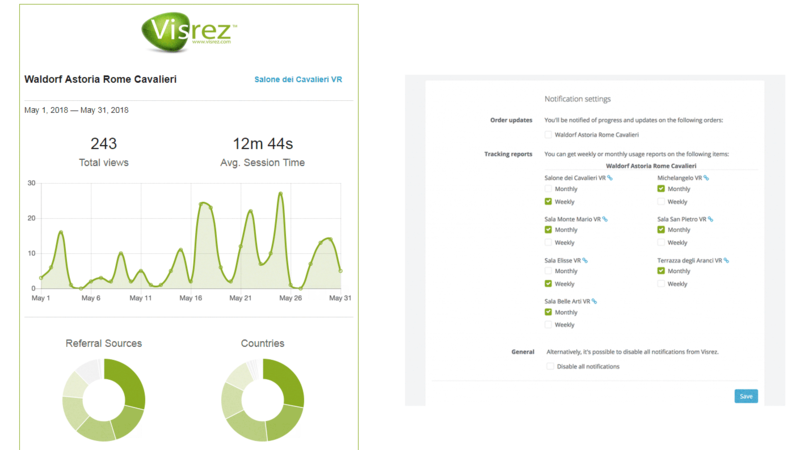 This revolutionary sales tool can be created by Visrez with no-site visits or photo-shoots required. 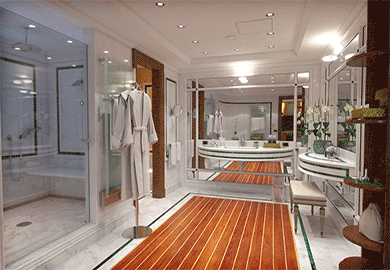 Once VR has been created it can be updated at any time as the spaces get renovated. This means that when you order a new carpet or banquet chairs the VR can be updated to match the changes without significant cost. It is this flexibility which makes WebVR such an effective sales tool which can revolutionise how venues present their spaces to customers online and in person. We have been asked many times by clients if they can make their own plans using the assets developed by Visrez. We are delighted to announce an update which now makes this possible. 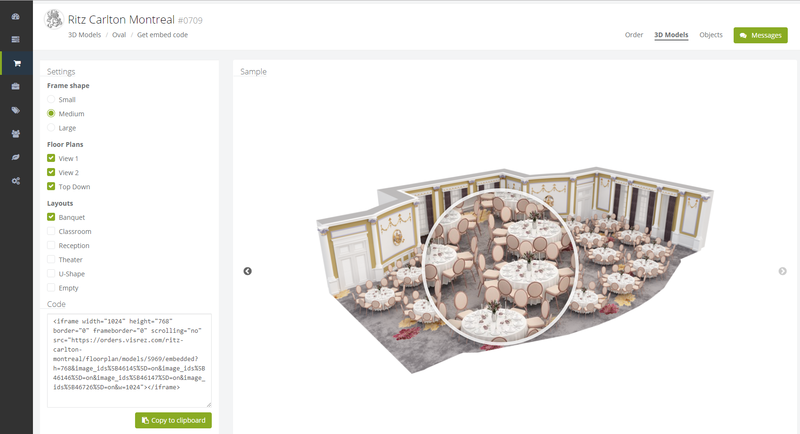 From today every new Meeting & Event Space order will include the individual 3D assets such as banquet sets as separate downloadable files. This will allow clients to make their own floor plans using our photo-realistic 3D assets. Each Room model is first uploaded with the standard three views. Below the Model Views, there is a new panel called Objects which contains the Table & Chair sets required for each set-up style. Please note these are exact replicas based on the reference shots supplied, they are not stock sets from our library. Clicking on any of the objects loads it full screen with the Zoom and pin tool for comments. This allows you to view the sets up close to make sure every detail is accurate. Each object must be approved individually before we create the set-up styles for the space. In the Layouts Panel, you will see there is now an Empty Room Layout along with the set-up styles. The Empty Room Model can now be downloaded on its own. Once you have saved the Empty Room & Table Objects you can create your own floor plans using any presentation app like PowerPoint or Keynote. You just drag & drop the table sets into the floorplan to create the desired capacity. To demonstrate how easy this is we created a Sample PowerPoint Template using the assets from this order. 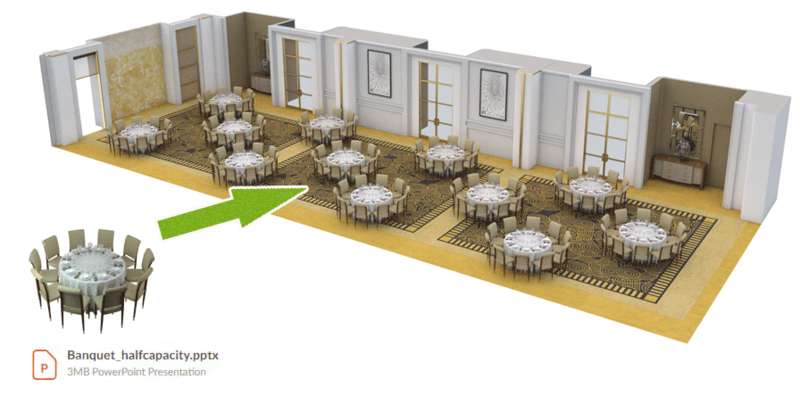 There is no additional cost for this upgrade for any future meeting & event space orders. For existing orders we are offering an $150 upgrade package to add the separate objects for any space currently in Visrez.